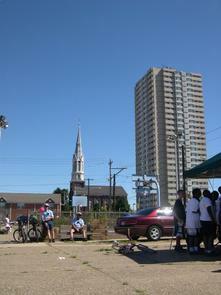 These adjacent parks are indicative of the ongoing transition of the neighborhood around Washington Avenue, where the ethnic mix of Irish, Italian, and African Americans – and more recent Southeast Asian and Mexican populations – converge with the young professionals who are moving into new luxury town homes. During the Civil War, Jefferson Square was used as a military encampment and parade ground. 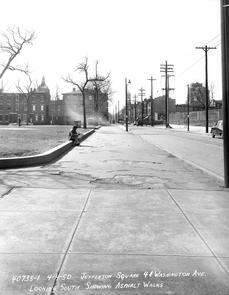 After the war, it was designed as a "strolling park," but it fell into disrepair in the 1960s and 1970s. 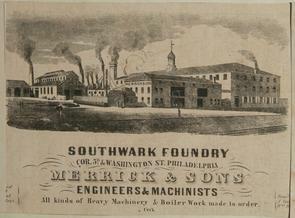 Jefferson Square's companion park, Sacks Playground, sits on the site of the old Southwark Foundry and Machine Company. Both parks have recently been reinvigorated. 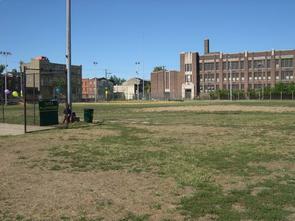 The arrival of Mexican immigrants and new young professionals reignited community interest in maintaining Jefferson Square, and Sacks Playground is used by South Philadelphia's growing Mexican community for soccer games and other recreation. Star-patterned Jefferson Square was originally constructed in the early 19th century. During the Civil War, the park was deeded to the Union Army and renamed Camp Jefferson. Located close to taverns, transportation, and military hospitals, Camp Jefferson was ideally situated for a troop encampment. After the war, Jefferson Square was deeded back to City of Philadelphia and was refurbished in the 1870s. 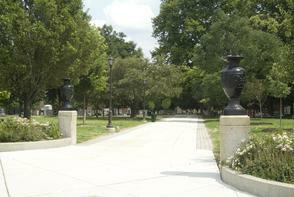 Jefferson Square was designed as a "strolling park" with its wide paths, open, pillared entranceways, benches, granite retaining walls, and a central focal point. The Southwark Plaza high-rise housing projects were built just north of the park in 1962. As the Southwark Towers fell into disrepair during the next two decades, the park also languished and was plagued by illegal dumping and drug traffic. 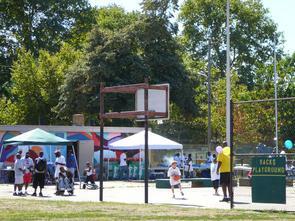 Residents rallied to save the park in the 1980s when the city proposed building an enclosed recreation center atop the site. 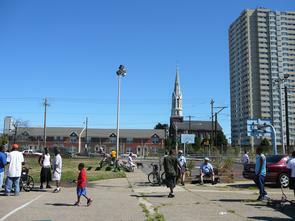 The towers were imploded in 2000 and replaced with low-rise, single family subsidized units. 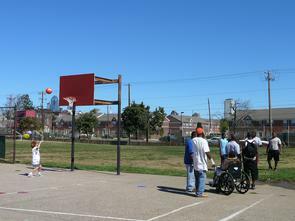 In 2002, the Jefferson Square Community Development Corporation built new town homes bordering the historic park. 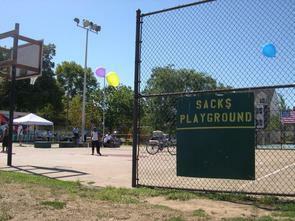 The use and condition of Sacks Park also fluctuated relative to changes in the surrounding neighborhood. In 2005, Home Depot and the National Council of La Raza, a national Latino civil rights and advocacy organization, co-sponsored an initiative to refurbish and clean up Sacks Playground and its recreation facilities. Budoff, Carrie. "Residents Protest Renaming of Part of Playground." The Philadelphia Inquirer, July 16, 2005. Couloumbis, Angela. 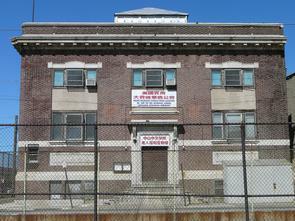 "Tempers Flare Over Tot Lot's Name." The Philadelphia Inquirer, June 17, 2005. 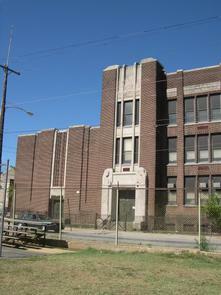 McCoy, Craig R. "100 Camp Out to Buy New Townhouses in S.Phila." The Philadelphia Inquirer, May 4, 2004. Soto, Ricardo Diaz. 2008. Interview by Joan L. Saverino. Videotape recording. June 23. Philadelphia, PA.
Stoiber, Julie. 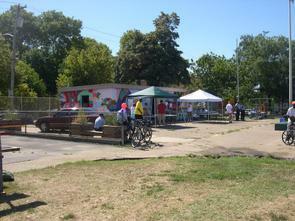 "Putting the Spark Back into City's Parks." The Philadelphia Inquirer, June 1, 2004. Wiegand, Ginny. "Working Hard for a Place to Play." The Philadelphia Inquirer, September 23, 1990.